The Teen and I were guest speakers at the Loyola College of Culion for a class of first year college entrepreneurship majors. She brought the younger perspective of life in the big city and what to expect abroad, different types of learning she has experienced (less rote learning, more critical thinking), etc. for kids, who while in first year college, were roughly her age or just a year older. I was so proud to see her speak in front of a group of 50+ folks, totally unrehearsed, based only on a few note cards she had prepared beforehand. Like father, like daughter, her Filipino language skills are left wanting, but I think she managed to communicate effectively nonetheless… Located in an airy school building under the shade of near century old acacia trees, this rural setting was just such an eye-opener for both the Teen and myself. While my educational training is mostly in business and finance, it was relatively easy to switch to the specific topic of entrepreneurship and it’s hard to explain, but the energy that comes from young people can be so incredibly positive. I hadn’t planned on it, but towards the end of my talk I threw down a challenge, and asked the kids to dream up a practical entrepreneurial idea for the entire class to pursue, and I would partially fund it if the business plan made sense and it seemed like it was worth pursuing. i hope they take me up on the challenge. It’s one thing to study entrepreneurship, but another matter all together to learn it while actually doing it. 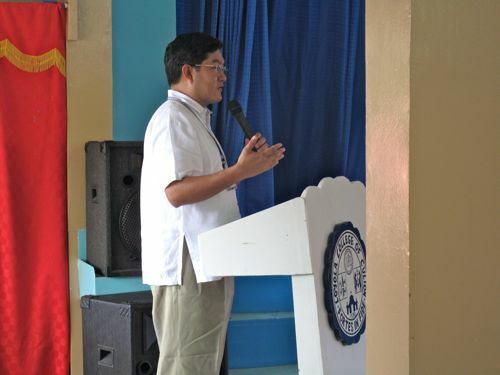 Many thanks to Ms. Analita G. Gacusan who invited us to speak at the school, and to Fr. Xavier Alpasa, the President of the school, for sitting in on the talk and his kind words of appreciation. Some of you may recognize Fr. Alpasa from his other efforts at the Ateneo to pursue entrepreneurial activities to uplift youth and others in impoverished neighborhoods… I think Culion is very lucky to have him there. The Teen and I thoroughly enjoyed our afternoon at the Loyola College of Culion and wish all of the students there a successful future in business! I can see that the next generation is already on the way to following in your worthy footsteps. And it seems she likes food too! Rafe Bartholomew, the author of “Pacific Rims,” speaks very good Tagalog, after spending only 3 years in RP researching for his book. Maybe you can take tips from him. Also, studies are showing that learning and mastering new languages delay the onset of Alzheimer’s. This is something kids nowadays should have: an inspiration to pursue worthy things because of their passion for it. Profit will come. I hope these kids would find ways as well to have a livelihood that won’t entail them having to leave their hometown (except maybe to travel). Ang ganda ng school nila. Reminds me of the schoolhouse in our province where my lola used to teach. Carol, I have lost 31-32 pounds (165 low) and have started re-feeding phase re-introducing carbohydrates and other foods. Will commence exercise as soon as I get rid of a cough I got from allergy issues… So I was on the diet for just 8 weeks and should be back to normal (albeit LESS) eating in another month or so. If I manage to stay around 170-173 pounds for the rest of the year, I will be very happy. it would also help if you use tagalog/Filipino when communicating inside the house ^.. This is one post that I would like to follow ….Please do update if the young adult did take on the challenge of pursuing a business. Thanks, You are one of the few filipinos who still believe in our new generation. Hi MM, maybe you should also do a talk in BA for those interested in entrepreneurship or business management (my son being one of them). They start the DP next school year, and I am positive you can give them valuable insight. I am sure you have a lot to share. Thanks in advance! Wow, kudos to The Teen! Kids nowadays are vocal of what they think and feel, which shows a high level of self confidence and appreciation. The students that listened to you and the Teen are so lucky because i think most of their parents wants their children to go abroad and work after they graduated. You gave them options that there are opportunities here. I hope that the students will took your challenge and succeed, it will be an example to students of other school. Glad to read something good amidst the proliferation of bad news, tragedy and the like in cyberspace and media. Well, media is fueled on bad news and much of cyberspace in gossip, assumptions, pretensions and like buttons. Thanks a lot MM for encouraging the youth to be entrepreneurs! They can learn a lot from someone who has a lot of experience being an entrepreneur. Bravo to both of you! I hated public speaking and hated the Filipino subject in school more. I still can’t get over the fact that my Filipino teacher has favoritism – favoring a classmate whose her cousin to the point of giving her the test questions…sigh… I’m just glad my “after school life” turned out better than her. Not gloating here but I do believe in Karma, so there. Thanks, MM! Truly remarkable weight loss after only 8 weeks! :) Bravo!!! With focused deterination, you could aim for 170 lbs as your maintainance weight. More importantly, that means then that you are healthier now than when you were having weight issues :). Congratulations for inspiring the students. I personally know Fr. Javi we both went to Miarayon Bukidnon to volunteer and have some quiet time. Culion is truly lucky to have him. I thank God for your efforts, the Teen’s. Father Alpasa, Ms. Gacusan to inspire our young. Reading this story and previous post on the feeding program is so encouraging – that you all are ‘tending the garden and making it bloom’ – yes, let us all continue, in our small quiet ways to tending the garden wherever God has planted us. We may feel discouraged at times, but all those efforts do make a difference. I can teach you Filipino for free MM! :) It will be my way of thanking you. Good job on the teen, language is just a matter of exposure for some hehehe. My boys picked up Tagalog after a month of living in PI (they lived there for about 3 years – 4 years ago) but they’re starting to forget some of the words, or they call it big Tagalog words. They kinda sound funny now in Tagalog but they could still understand it. I dream in English, can express myself better in English (more animated) and really have to get back and stay/live at any paises de hispano-hablante so I dont get rusty with my Spanish, you lose it when you dont use they say. Give me 6 months in Madrid and I’d be speaking like a local again. You can take Filipino/Tagalog classes with my daughter hehehe, she cries sometimes when we laugh at a Filipino joke because she’s the only one who wouldn’t get it hahaha poor thing. Thanks to my mom and dad, Tagalog was always spoken at home so we could never forget it. More power to the Teen and to you, MM. No stage fright there. 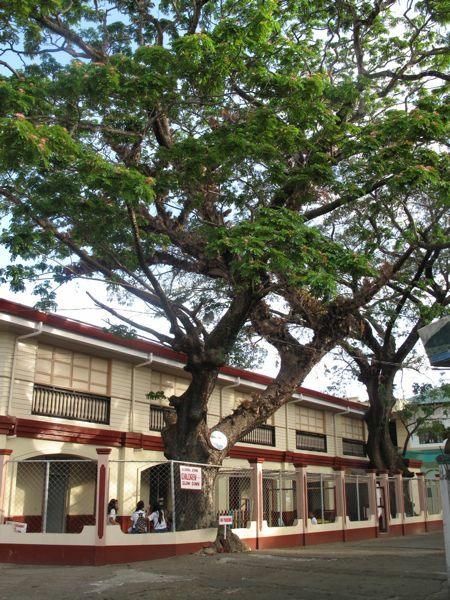 I noticed the beautiful acacia trees that are preserved beside the building. I am really saddened to hear that the acacia trees that lined along the road to Carcar/Barili might be cut down for the widening of the road. Sigh, I just hope they can think of other ways to go around those majestic trees.